Erynn Ballard and Easy. Photos copyright Sportfot. Wellington, FL – April 1, 2016 – The young jumpers took to the International Ring at the Palm Beach International Equestrian Center (PBIEC) on Friday to compete in their final classes of the 2016 Winter Equestrian Festival (WEF). Erynn Ballard (CAN) and Easy were victorious in the $20,000 Adequan® Young Jumper Seven-Year-Old Final, Adolpho Franco (BRA) and Mia won the $15,000 Adequan® Young Jumper Six-Year-Old Final, and 13 horse and rider combinations jumped clear in the $10,000 Gut Einhaus Young Jumper Five-Year-Old Final to earn prizes, rewarding clear rounds from the circuit’s youngest horses. The 2016 WEF circuit concludes with its twelfth and final week of competition, sponsored by Rolex, featuring CSI 5* jumper and ‘AA’ rated hunter competition through April 3, 2016. Saturday highlights include the $130,000 Suncast® 1.50m Championship Jumper Classic Final Jump-off, presented by SOVARO®, at 6:30 p.m. followed by the $500,000 Rolex Grand Prix CSI 5*. 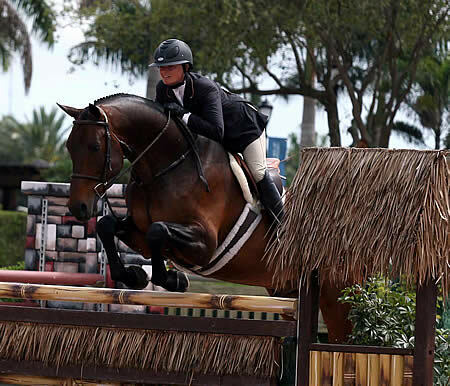 The circuit concludes on Sunday featuring the final round of the $50,000 USHJA International Hunter Derby on the derby field at The Stadium at PBIEC. Anthony D’Ambrosio (USA) set the course for 52 starters in the $20,000 Adequan® Young Jumper Seven-Year-Old Final, with 13 clear rounds to advance to the jump-off, and five double clear rounds. Riders were given an a/b option to either jump-off immediately following their round or wait until the end of the class, and all but one chose option a to go immediately following their first round. Alexandra Paillot set the pace in 40.32 seconds aboard Paillot Equine Consulting Inc.’s Jalanta P, eventually finishing fourth. Laura Kraut jumped a faster round in 38.95 seconds with Poden Farm’s Cicero’s Electric, but settled for second place in the end. Katie Dinan jumped into third place with Grant Road Parnters’ Chiara M in a time of 39.45 seconds. Erynn Ballard and Javier Salvador Stables’ Easy were next to clear the course, shaving over three seconds off of the leading time to win it in 35.42 seconds. Cody Auer later jumped into fifth place with a clear round in 41.29 seconds riding Sarah Ryan’s Elertina. Seven-year-old winner, Easy, is a Dutch Warmblood mare (Mr. Blue x Burggraaf) owned by Javier Salvador. Ballard explained that she purchased a new horse named Z Diamanty from Salvador at the beginning of the winter, and through the process of getting to know each other and showing that horse, he asked if Ballard would show Easy in the seven-year-olds. She just got the ride on Easy halfway through the circuit, and their plan was to gear the mare up for this final class. Easy jumped some six-year-old classes last year and spent her summer showing in Europe in 2015. She is a sale horse and came to WEF to be promoted. If she does not get sold, she will continue on with Ballard through the summer. The $15,000 Adequan® Young Jumper Six-Year-Old Final was held in the International Ring Friday morning with a win for Adolpho Franco aboard Beth Franco’s Mia. Anthony D’Ambrosio (USA) set the course for 45 entries, and yielded 24 to advance to the jump-off. The jump-off was held with an a/b option for riders to either jump the short course immediately following their round or wait until the end. Franco jumped at the end of the class and returned for his jump-off last to go with Mia, clocking the winning time of 33.98 seconds. The pair finished well ahead of second place finishers Ronan McGuigan and Blythe Masters’ Maximus, who jumped off immediately after their earlier round in a time of 36.26 seconds. David Beisel and Harlow Investment Enterprises’ For Sunday also jumped off at the end with a time of 37.14 seconds to finish third. James Wingrave and his own Casio-Royale also took the b option and finished their jump-off round in 37.80 seconds to place fourth. 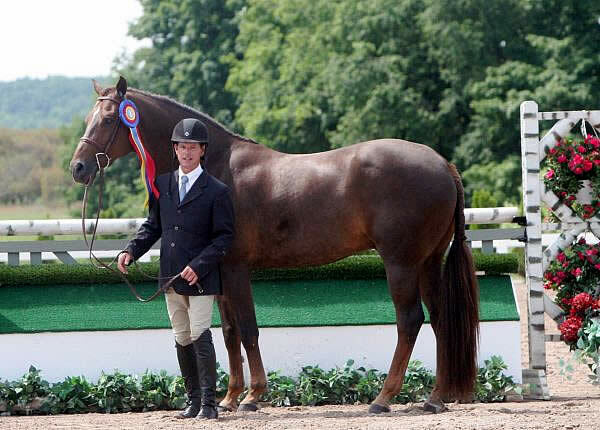 Class winner, Mia, is a six-year-old Holsteiner mare by Quick Star x Contender, owned and home bred by Franco and his wife, Beth Goodwin Franco. Speaking of his winning mount, Franco stated, “Since she was four years old she has just been nice, wanting to go, and wanting to do the right thing. She just took care of me. I do not know if she is going to jump big classes like 1.60m or 1.50m, but whatever she does, she will do very well. Franco explained that week six of WEF was the first time that he got a good feel for how competitive Mia could be. Franco also explained that Mia is very calm at home, but she knows when it is show time and gets her energy up. Franco’s wife is due to have the baby next week, and when she comes back to riding, she will take over the ride on Mia again. Franco is originally from Brazil, but came to the U.S. in 2009 to work for Paulo Santana. He has known Santana since he was six years old and trained with Santana his whole life. Now that Franco is married, he and his wife are based in Wellington and have their own business. They plan to stay in Wellington for a couple of months with the new baby and then head to Tryon, NC and Lexington, KY to show for the summer. The $10,000 Gut Einhaus Young Jumper Five-Year-Old Final was held Friday morning, awarding prize money for clear rounds overall from the promising young horses of show jumping sport. Thirteen entries jumped clear rounds to be rewarded for their efforts. Concluding the day in the International Ring on Friday, Alonso Valdez Prado and Chichester 3 won the $2,500 MAYBACH – ICONS OF LUXURY High Amateur-Owner Jumper power and speed. Garland Alban finished the WEF circuit on a high note as the champion of the Adult Amateur Hunter 36-49 Section A, which was presented by Triple Crown Blankets. Alban and Imagine topped two of the four over fences classes and placed seventh in another. Imagine also took home a second-place ribbon in the under saddle to clinch the championship title. Danielle Baran rode her own Say When to the reserve honors. Baran earned two second place ribbons, a first, and a fifth over fences aboard her eight-year-old Dutch Warmblood gelding. Alban aimed to spend this week getting to know her new mount, but winning the championship was a pleasant surprise. “He’s done the 3’6″ divisions quite a bit and has been very successful with his owner Kerry Anne,” Alban explained. Imagine proved to be a great match for Alban. She was quick to praise the gelding’s performance this week. “I definitely didn’t ride him perfectly in all the over fences classes, and he worked out the kinks for me,” she laughed. “I definitely liked my first round the best today,” Alban commented. “I certainly misjudged the first fence in the second class. I came out pleased with my first round, but maybe wasn’t quite as focused as I wish I had been in the second,” she admitted. 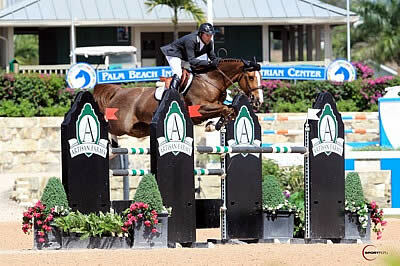 The opportunity to compete at WEF is one that Alban does not take lightly or for granted. As a mother of eight, four of her own children and four stepchildren, she feels lucky that riding fits into her busy schedule. When in Maryland, Alban rides with Katie Francella at Caves Farm. The team at Boggs Hill Farm, including Tim and Kelly Goguen, has been training Alban in Florida. “My trainers Tim and Kelly Goguen do such a wonderful job with the horses. They always have them in great shape and doing really well. They have to put up with me flying in to town and giving my amateur rides and then leaving again!” Alban laughed. Alban currently shares her passion for riding with her ten-year-old daughter Georgia, who shows in the Small Pony Hunter divisions. “The schedule at WEF is very helpful for me, because I can come down on Wednesday and compete Thursday and Friday,” Alban stated. WEF 12 continues on Saturday featuring the $130,000 Suncast® 1.50m Championship Jumper Classic Final Jump-off, presented by SOVARO®, at 6:30 p.m. in the International Ring, followed by the $500,000 Rolex Grand Prix CSI 5*. The first round of the $50,000 USHJA International Hunter Derby will also be held on Saturday in the E. R. Mische Grand Hunter Ring. The top 25 competitors will then continue on to the second round on the derby field at The Stadium at PBIEC on Sunday at 1 p.m. For more information and full results, please visit www.pbiec.com. Erynn Ballard and Valentino Now. Photos by Ben Radvanyi Photography. Toronto, Ontario – Erynn Ballard of Tottenham, ON riding Valentino Now won the $15,000 Braeburn Farms Hunter Derby on Monday night, November 9, at The Royal Horse Show®, held as part of the Royal Agricultural Winter Fair in downtown Toronto, ON. All horse and rider combinations jumped one round of competition, earning scores for their performances. Ballard was the sixth rider into the Ricoh Coliseum and laid down a trip that earned a score of 86 points from judges William Ellis of Ocala, FL and Mike Rosser of Southern Pines, NC. Ballard was also awarded ten bonus points for taking all of the high options, as well as seven bonus points for handiness, giving her an overall score of 103 points for the victory. Already successful in the show jumping ring having won a 1.30m class at Spruce Meadows in Calgary, AB this year, Ballard decided to test Valentino Now, owned by MVB Group, in the hunter ring. “He’s at an advantage because he’s seen more through his jumper experience than your average hunter,” explained Ballard, 35. “I think any experience is good experience, and Valentino’s days as a jumper paid off tonight. He made the transition to hunters easily; it’s a pleasure to have one that’s not complicated. Ryan Roy of King City, ON and Bayridge, owned by Doug Bannister, placed close behind Ballard in second with an overall score of 102, while Laurie Bucci of St. Jean, QC took third on a score of 101 aboard Quatro Z Fortuna for owner Monique Geseron. Acclaimed equitation trainer Brent Balisky of Langley, BC has been coming to the Royal Horse Show for 30 years, but had never before competed himself. For the $15,000 Braeburn Farms Hunter Derby, Balisky traded his usual ringside view to take fourth in the irons of Vigolo Z, owned by Wendy Valdes, with a score of 98. Rounding out the top five was Ballard with a score of 96, this time aboard Contact, owned by Heather Delfino, Looking Back Farm and Redfield Farm. Hunter Derby Course Designer Robert Carey of Caledon, ON utilized jump obstacles designed and constructed by Jeff Brandmaier of Guelph, ON and his wife Margaret ‘Muffie’ Guthrie, who are the founders and presenting sponsors of the Canadian Hunter Derby Series. To purchase Royal Horse Show tickets, please visit Ticketmaster at http://www.ticketmaster.ca/venueartist/131553/986584. Erin Ballard and Appy Cara. Photo Credit Katy Whitt Photography. October 28, 2015, Calgary, Alberta: The pulse has quickened at the Royal West in Week Two as the big names began gearing up for the weekend’s big prizes. On Wednesday Canada’s Erynn Ballard sharpened her game in the $45,000 GGT Footing/Whittling Structures Classic 1.45 m with a dramatic win in an all-Canadian 11-horse jump-off. In what was an all-female winning podium, Ballard rode her chestnut 10-year-old gelding Appy Cara to a clear round that beat out Ali Ramsay on the bay 8-year-old mare Hermelien vd Hooghoeve by 1.82 seconds, also with a clear round. Third place in the tightly bunched field went to Vanessa Mannix on the bay 14-year-old gelding Nirvanan de Terlong) who rode clean as well. Other riders making the jump-off were Laura Jane Tidball (Prim’ de Lairaud), John Anderson (Terrific), Jill Henselwood (Farfelu du Printemps), Keean White (For Freedom Z, Carrera van de het Westleven Z), Ben Asselin (Plume de la Roque), Chris Sorenson (Bobby), and Yann Candele (Granit S). In the afternoon’s feature event, the $25,000 Salentein Wines Canadian Hunter Derby 3’6”, Brent Baliski riding Viogolo Z took home top honours with 106.00 points. Darcy Hayes aboard CrushIn captured second place second with 104.5 points. And in third was Ashton Belcher aboard Contifax. In the afternoon’s $10,000 Hunter Derby 3’0”, Canada’s Rodney Tulloch took top spot aboard Glory Bound. In second was Shannon Haney on her mount Erek. Third place ribbon was won by on Michelle James Picasso. For more information, contact Rhys Dowbiggin at Redbackpack PR redbackpackpr@gmail.com. RMSJ hosts its tournaments at Anderson Ranch in Calgary’s south end, a world-class facility featuring permanent stabling for 300 horses and a grass grand prix field complete with natural obstacles. For more information on Rocky Mountain Show Jumping, please visit www.rmsj.ca. Hosted by Rocky Mountain Show Jumping, Royal West is the heart for equestrian competition. Over ten days at the Agrium Western Events Center at Stampede Park, Royal West features both international and national events with over half of a million dollars in prize money handed out throughout the tournament. The tournament hosts the Longines FEI World Cup™ Jumping Calgary, the Spirit of the West Cup, the Royal West International Championship, Western Canadian Hunter Derbies and when applicable the CET Medal National Finals. ©ESI Photography. After a successful two weeks at HITS Culpeper, Rachel Udelson and her own VDL Wardorette won the $40,000 Purina Mills Grand Prix. CULPEPER, VA (July 17, 2012) – HITS Culpeper capped two weeks of horse shows on Sunday with a record number of competitors spending the early part of their summer at the Cavalier Classic. It was Rachel Udelson of Middleburg, Virginia and her own VDL Wardorette who rode to top honors in Sunday’s $40,000 Purina Mills Grand Prix, presented by Pfizer Animal Health. Udelson was one of three to go double clear and used to last round of the day to steal the win. After a win in last week’s Brook Ledge Open Jumper Prix and a fourth-place finish in last Sunday’s Grand Prix, all the pieces fell into place for Udelson and her nine-year-old mare as they topped a field of 25. The pair bested a 13 obstacle course and was one of eight to advance to the jump-off. Wellington, FL (March 27, 2012) – Erynn Ballard, a Canadian rider and trainer, cruised to victory in the Regular Conformation Hunters aboard Timber Ridge during the eighth week of the 2012 Winter Equestrian Festival, capturing the championship in the division. The Sanctuary Equine Sports Therapy & Rehabilitation Center, a world-class rehab and conditioning facility located in Ocala, Florida, sponsors the Regular Conformation Hunters as well as the First Year Green, Second Year Green and Green Conformation classes. 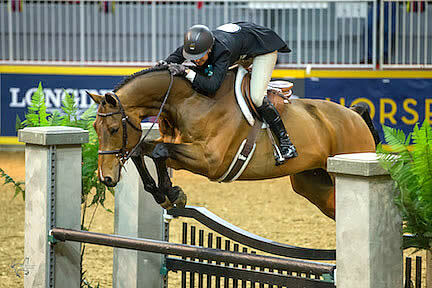 Ballard is one of Canada’s most talented equestrian show jumpers and trainers. She has become one of the most recognized names in the industry due to her consistent wins in the show ring as well as her exceptional training methods. Ballard trains out of her Looking Back Farm in Ontario, Canada. Other Sanctuary sponsored champions during week eight of the Winter Equestrian Festival included: Peter Pletcher who won the First Year Green Championship on Westbrooke; Shawn Casady aboard Paul Stuart, winners of the Green Conformation Hunters: and Christa Endicott who captured the Second Year Green Championship on Come Monday. Wellington, FL – March 1, 2012 – Canada’s Eric Lamaze and Coriana Van Klapscheut, owned by Artisan Farms LLC, emerged victorious in Thursday afternoon’s $32,000 WEF Challenge Cup Round 8 at the FTI Consulting Winter Equestrian Festival (WEF). With 82 starters and a ten horse jump-off, the pair beat out Nick Skelton (GBR) and Beverley Widdowson’s Carlo 273, who finished second and David Will (GER) and Klaus Isaak’s Colorit, who placed third. Week eight of the FTI WEF, sponsored by G&C Farm, will feature CSIO competition through Sunday, March 4. The week will feature the $75,000 FEI Nations Cup CSIO 4* presented by G&C Farm on Friday, March 2, the $35,000 VitaFlex Match Races and $35,000 Hermès Puissance on Saturday, March 3, as well as the $150,000 Wellington Equestrian Realty CSIO 4* Grand Prix on Sunday, March 4. 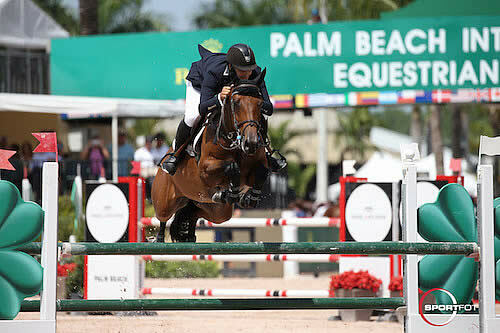 The 2012 FTI WEF has 12 weeks of competition that conclude on April 1, 2012, and will be awarding more than $6 million in prize money through the circuit. Traverse City, MI – July 7, 2011 – Sun and a light breeze set the stage for a wonderful day for the hunters at Horse Shows by the Bay today. It was very busy in the R. L. Polk Family Main Hunter Ring, with over ninety rounds to be seen. As the professional hunter divisions came to a close this afternoon, several championship ribbons were presented, with Peter Pletcher of Magnolia, TX, Kelley Farmer of Keswick, VA, and Erynn Ballard of Hornby, OT taking home these top honors. In the Second Year Green Working Hunter division Cookie Beck and Erynn Ballard brought their “A” game, both riding two horses in the division. Ballard was able to secure the Championship title on Sigfried, owned by Susanne Stroh, with a blue ribbon in both the hunter and the handy hunter rounds today. Reserve Champion went to Cookie Beck aboard Last Call, owned by Lisa Cudahy. “Sigfried is probably the best second-year horse that we have right now, and he’s won a lot for me – he won in Palm Beach, he won a class at Devon, and I have a really good relationship with him. I just meet him at the horse shows because he doesn’t live with me. We just love each other, and he always tries hard. Today he just went out and did the best that he could, the handy was great, and he just tries so hard every time.” says Ballard of her mount Sigfried.